When I first got into startups, one of my core responsibilities was to acquire new customers. The problem was, back then, I had no idea how to acquire new customers. As I explored, I learned about sales and marketing, and began to understanding how they are used to acquire customers. It turns out, sales and marketing can be really fun, and really powerful. I remember searching the internet for a how-to guide to get me started. There are plenty of blog posts out there, but they all seemed to go into too much depth, or skip the beginner stuff. I wanted something that started with the basic fundamentals so I could work my way up. Essentially, a for-dummy’s guide to sales and marketing for a B2B startup. 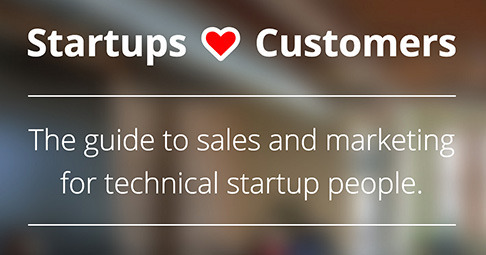 Fast forward a few years to now, and I decided to write that guide: Startups <3 Customers. It’s a guide to the basics of sales and marketing, particularly helpful for technical founders and employees at B2B startups. If you want to understand what the business people actually do, or you need to get the basics of sales and marketing set up yourself, this is the guide for you. Check it out at startupsheartcustomers.com. I hope it is helpful, and if you have any questions or feedback, email me anytime. Good luck!